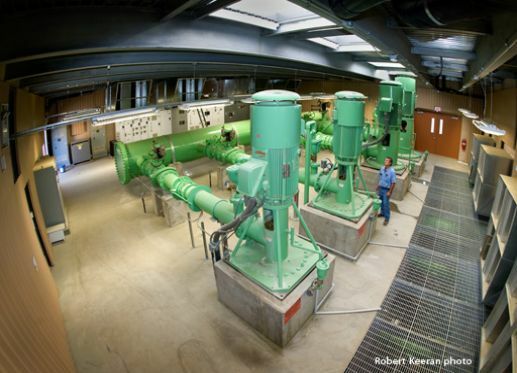 Water pump stations will typically move water, using either vertical or horizontal turbine pumps, from a lower elevation to a higher elevation where it will be stored in tanks or reservoirs. These reservoirs can either be above-ground or below-ground concrete tanks or above-ground bolted or welded steel tanks. Each tank will store the water in reserve until it can be used and released by gravity at a later date. This holding period for recycled water tanks is sometimes known as the retention period where the bigger particles can settle to the bottom before the water is sent to a water treatment facility. Sewage pump stations (known also as lift stations) receive raw sewage from gravity inlet pipes or pipes that are sloped at a downward angle so that the solid waste can move without pressure. The sewage will dump into a concrete storage tank known as a wet well and will then be pumped up by submersible sewage pumps and a force main into a higher elevation concrete manhole. Once in the manhole, the sewage can continue its downhill path through gravity pipes to the next lift station or to a treatment facility. The levels of water in reservoirs and sewage in wet wells are controlled by electrical instrumentation. Low and high level points are set in these storing facilities so that when the liquid reaches one of these predetermined points the pumps in the pump stations will either shut on or shut off. TC Construction has years of experience and a deep knowledge of building conveyance facilities.